This morning's breakfast was really rushed as I had about 2 minutes to eat it before our car came to go into London! We had meetings all day so I had to be quick as I normally eat after the school run (I'm never hungry enough at 7:30am!) 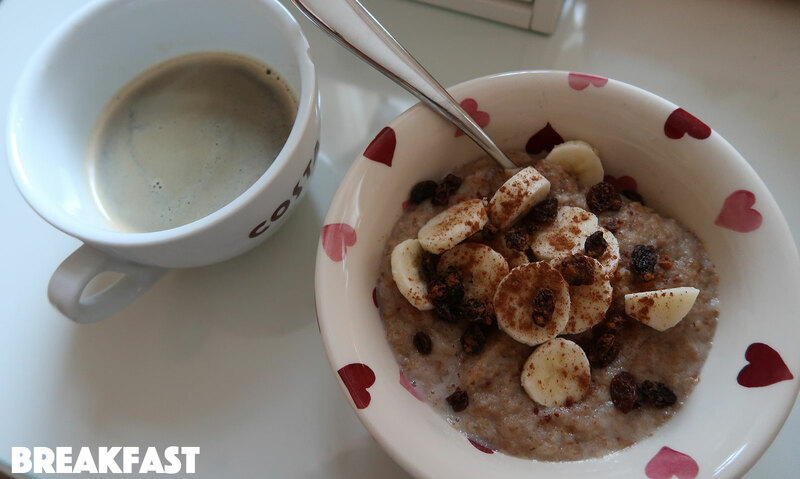 My favourite quick & easy breakfast is Weetabix with almond milk (hot - I heat it up for 1 min 30 in the microwave). I added 1/2 banana, raisins and some cinnamon on top. I also had a black coffee and a bottle of water in the car! 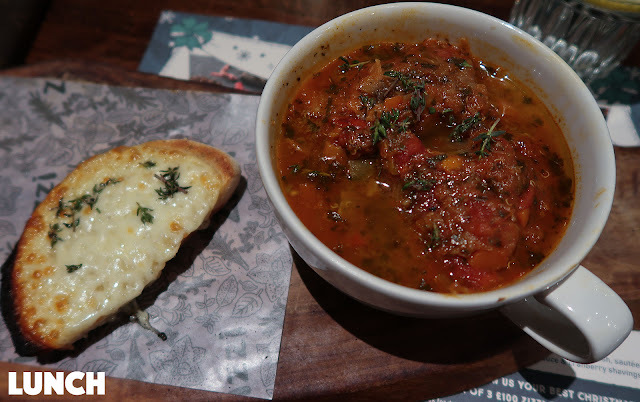 Lunch happened a lot later at about 2 o'clock because our meeting ran late so Jonathan, Francesca & ended up going to Zizzi's and I got the Toscana soup (which is actually a starter) with mozzarella bread. I can't remember exactly what was in it but I think it was quinoa, tomatoes, thyme and lots of chunky vegetables. It was really yummy and perfect for a freezing day! 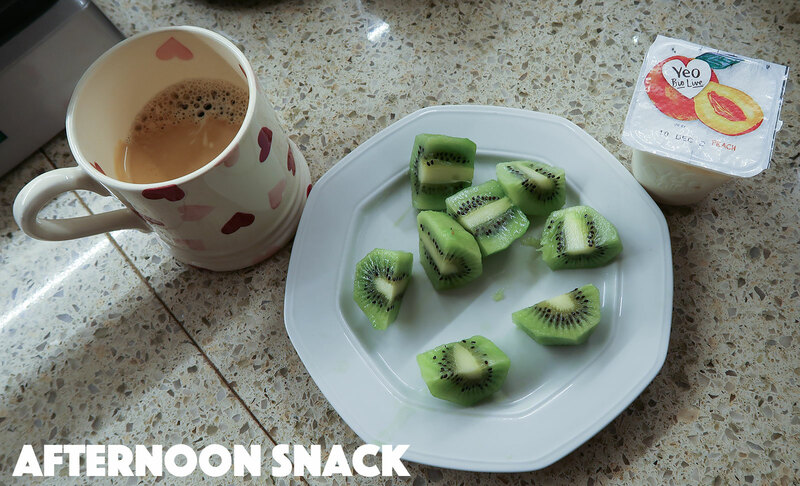 By the time we got home it was around 5pm and I was hungry again so made myself a coffee (black) and two kiwis & a peach bio-live yoghurt as a snack. I've heard kiwis are packed with vitamin C and are good for warding off colds & winter sickness which is exactly what I DON'T need being pregnant with lots of bugs going round! 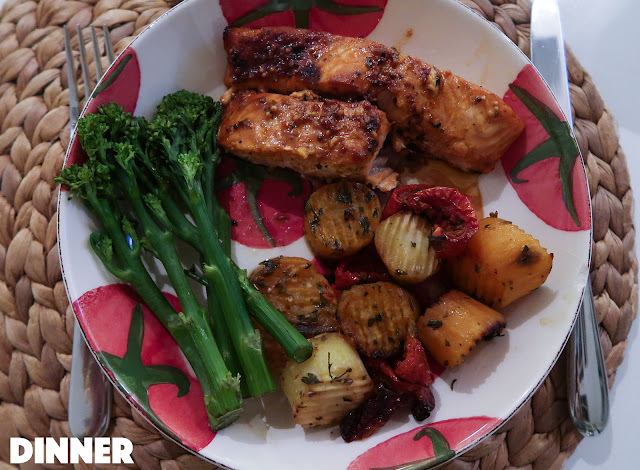 For dinner we had baked salmon with roasted root veggies (sweet potato, parsnips, carrots), sundried tomatoes and steamed broccoli. I also had another bottle of water to drink and nibbled on some extra broccoli before dinner, haha! For a kind of evening snack/dessert I attempted to keep it healthy-ish with a chai tea made with hot almond milk and a slice of our homemade banana bread with honey. 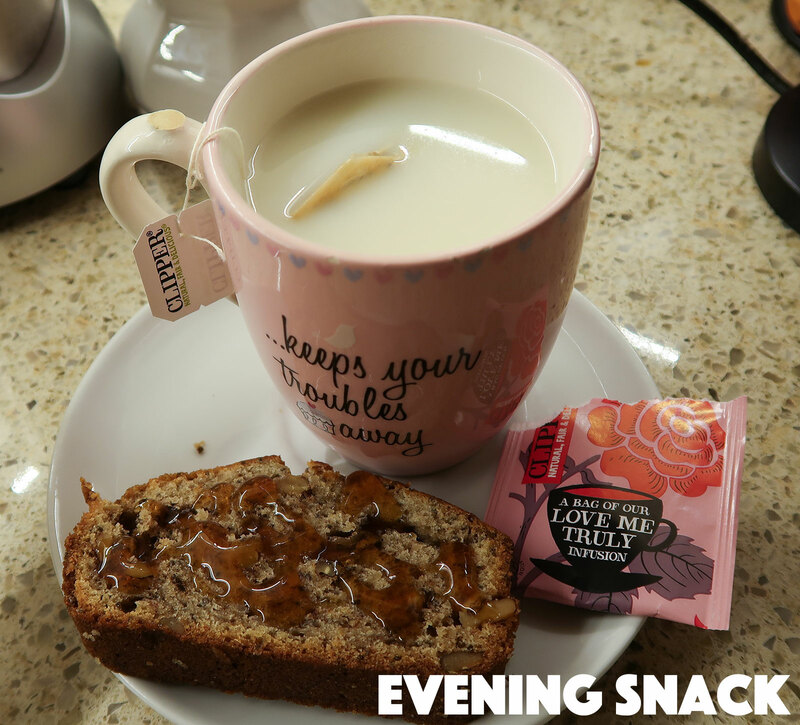 The banana bread comes from Fearne Cotton's book, Cook Happy Cook Healthy and is a super delicious and moist recipe using chia seeds & walnuts. Definitely recommend it! I also have this for breakfast sometimes. The soup looks amazing, also loved the video, I like when a bit of real life slips in lol. :) Anna , can you please share the recipe for Bannana Bread ? I am planning on making something healty to grab in the morning . Hello Anna! I've been following your blog for awhile now and was really inspired by you. Recently I finally have the guts to open a blog for my own and trying things out. Will really appreciate if you could check it out. I apologize if the picture quality aren't the best because I don't have a camera and still saving on one because I am a student. :( don't stop inspiring others! x. The roasted roots veggies look so tasty!